The Honorary Consul is available (during consulate business hours as explained below), for inquires and assistance. There is a consulate support assistant for inquires in Thai. Services provided are in line with functions and limitations explained on this, and the Australian Embassy Bangkok website. If you are in Thailand, phone the embassy on 02 344 6300 and select option 1 to be transferred to the 24 hour Consular Emergency Center in the Department of Foreign Affairs and Trade in Canberra, Australia. If your call is not automatically transferred, you can call the Consular Emergency Center direct on +61 2 6261 3305 (international call charges apply). From Canal Road at the intersection with Samaoeng Road (1269) turn right. From Canal Road intersection drive up Samoeng Road for 1.2 km to entrance to Moo Baan Sansaran & Health Club. From Hangdong Road (108) at the intersection with Hwy 121 turn right and proceed ahead through the next lights (canal road intersection). 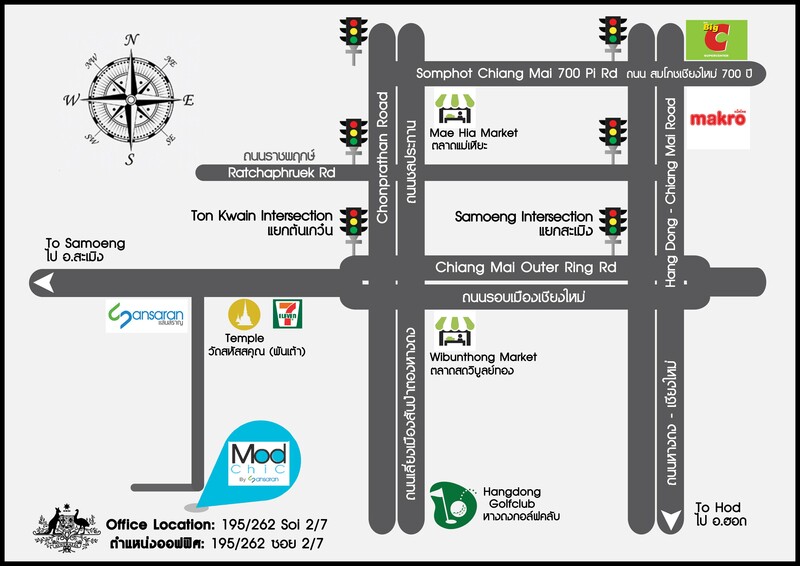 From Canal Road intersection drive up Samoeng Road for 1.2 km to entrance to Moo Baan Sansaran & Health Club. Drive past the Health Club and Office to last (end of the road) Moo Baan – Sansaran Mod Chic.